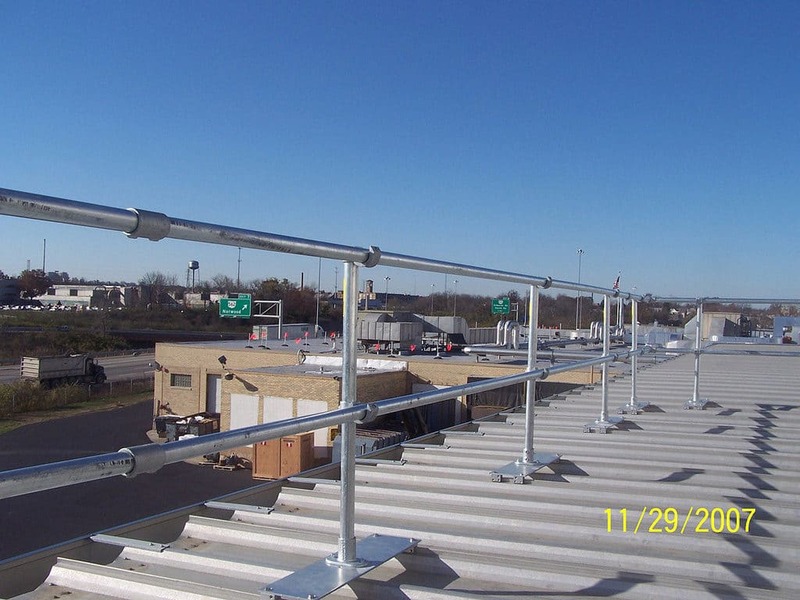 Flexible Lifeline System’s metal roof railing solution that will protect your employees from harm and your company from liability. 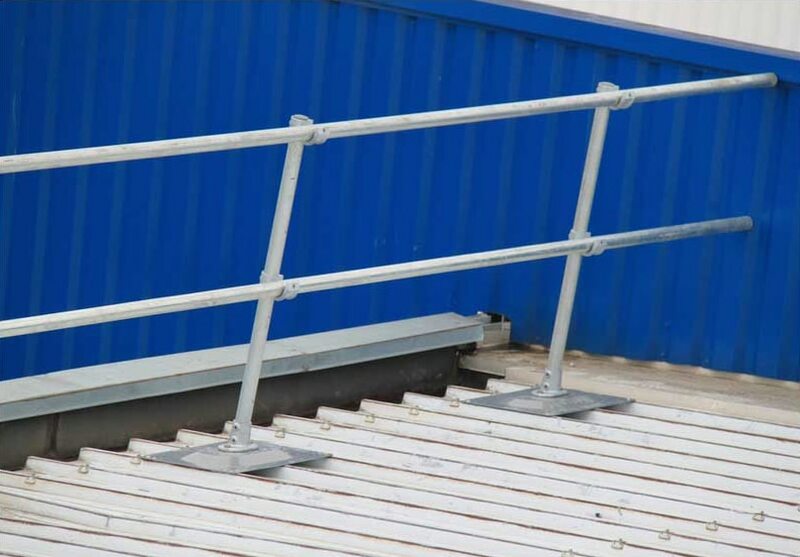 The FlexGuard Topfix railing system is pre-engineered to work with both standing seam and corrugated roof panels. 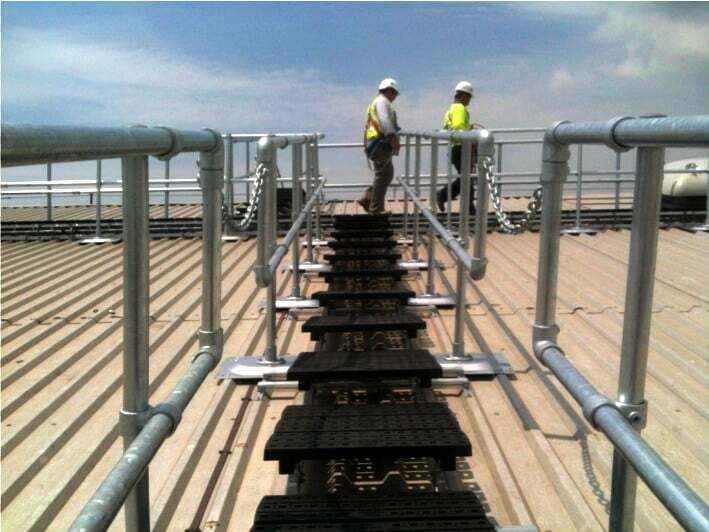 Fully compliant with OSHA regulations, the railing system protects workers against rooftop and fall hazards. 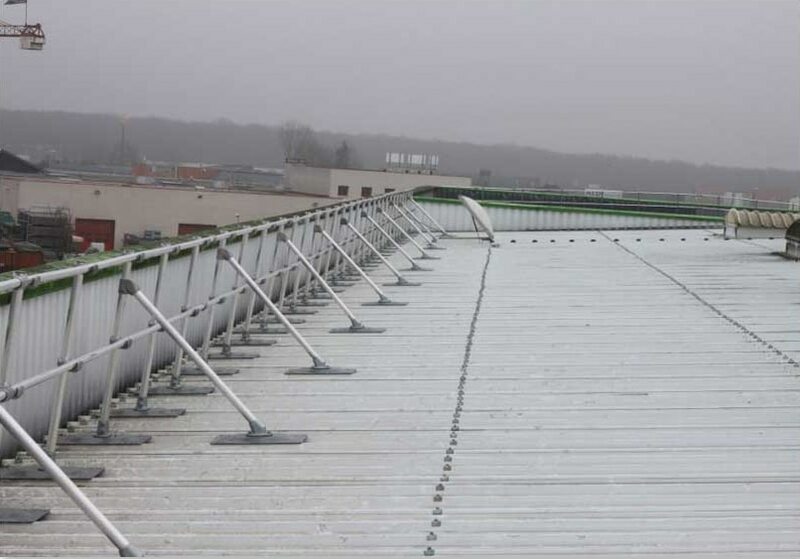 Because it’s pre-engineered, the FlexGuard Topfix system can configured for your roof in days eliminating time-consuming and costly design work. 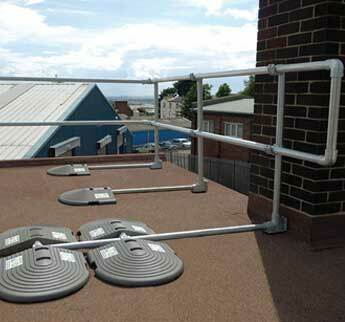 There are several reasons why the FlexGuard Topfix railing system is the best solution for metal roof safety. 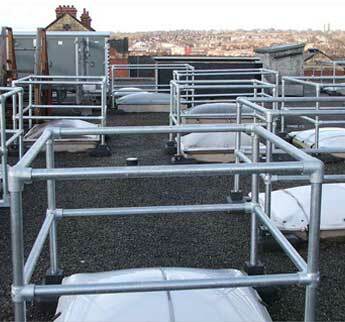 Railing doesn’t require workers to harness and hook up to a system. 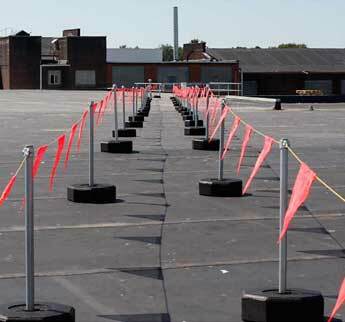 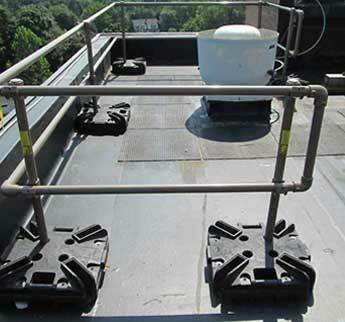 While lifelines, anchor points, and lanyards require ongoing maintenance and training, a FlexGuard rooftop railing system provides the simplest solution by eliminating the fall hazard altogether. 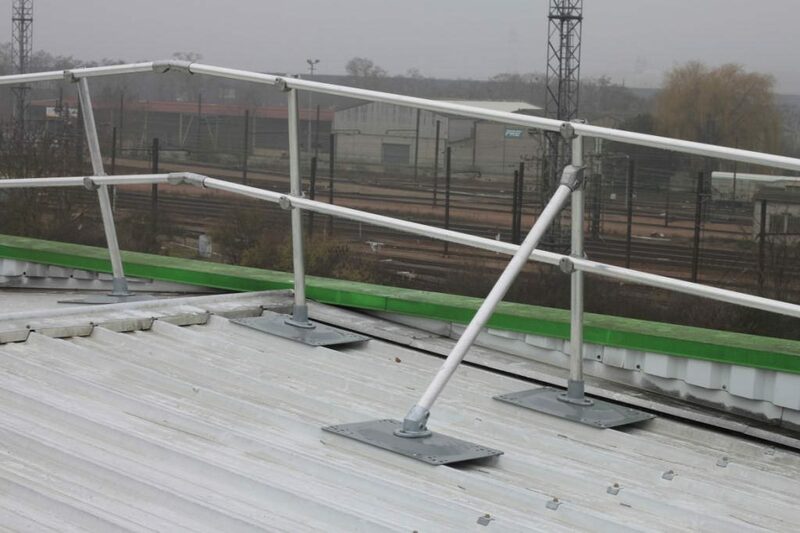 The modular components of the FlexGuard Topfix railing system can configured to accommodate the specific fall protection needs of your roof including ladder access and roof top obstacles. 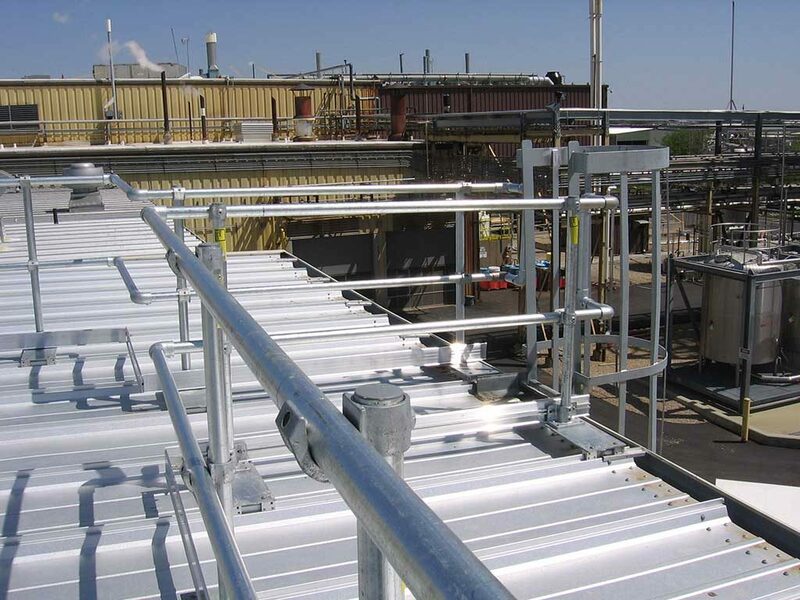 Pre-engineered modular components allow the system to be configured and implemented quickly and easily by contractors, maintenance professionals. 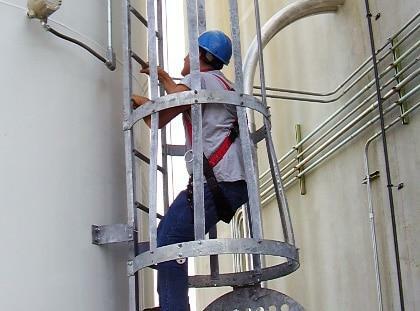 FLS personnel can be used to install your system, but specialized labor is not required. 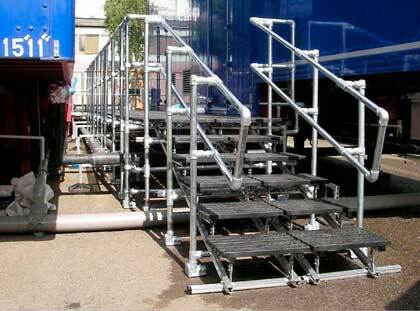 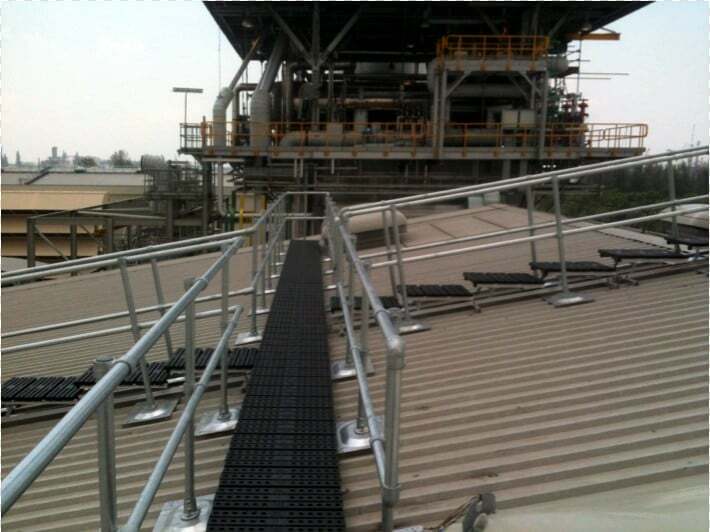 FLS FlexGuard railing systems are fully compliant to OSHA and Industry Standards. 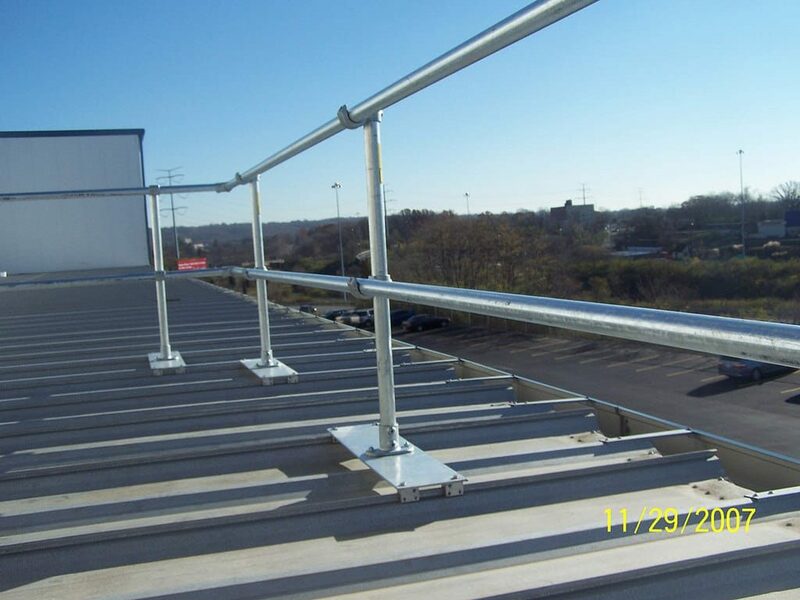 Protect yourself against fines, your business against liability, and most importantly, your workers with a railing system that meets OSHA standards. 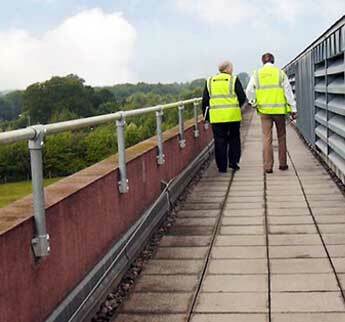 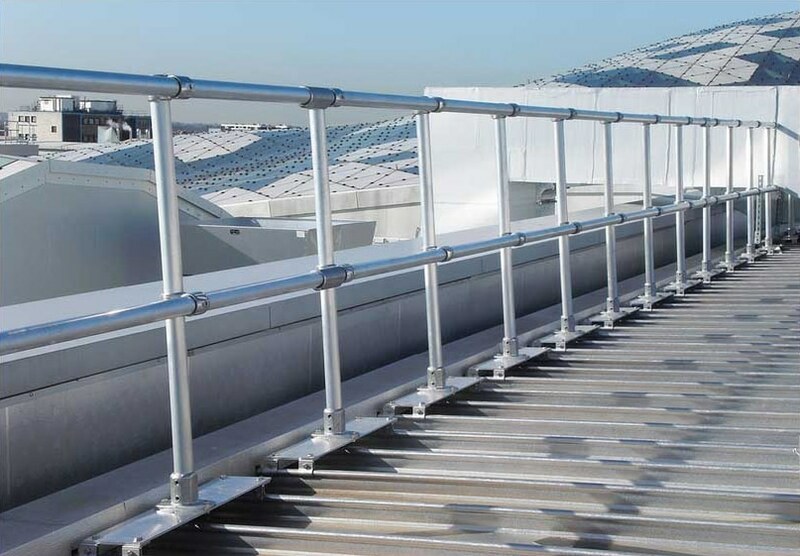 FlexGuard railing systems meet fall protection standards that have been established around the world and have been implemented in virtually every possible rooftop application. 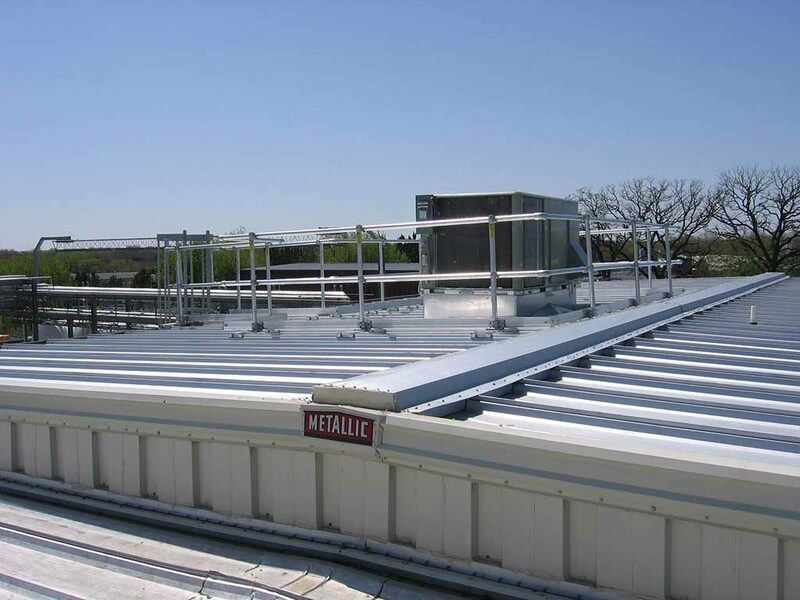 FLS has Topfix metal railing solutions for both Standing Seam and Corrugated metal roofs. 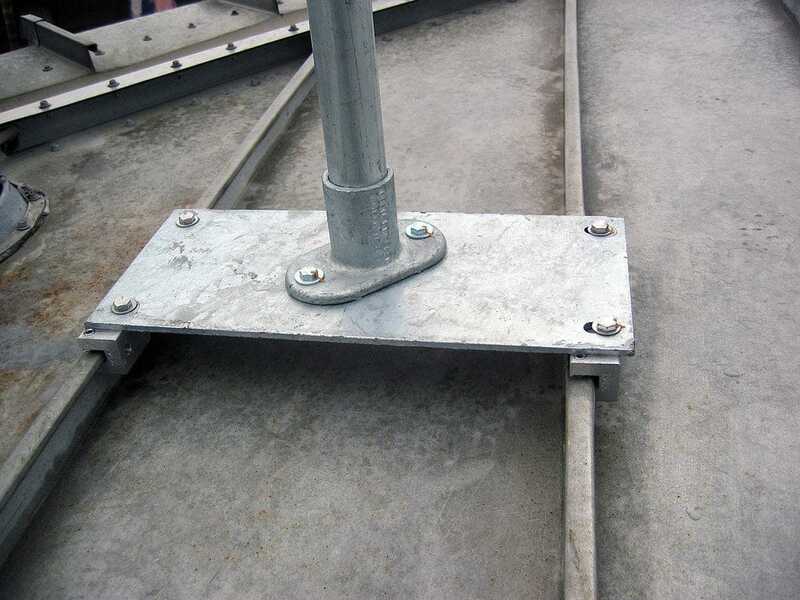 The FlexGuard Topfix guardrail solution for corrugated metal roofs utilizes special baseplates that connect directly to the corrugated metal rooftop panels distributing the system load to the roof. 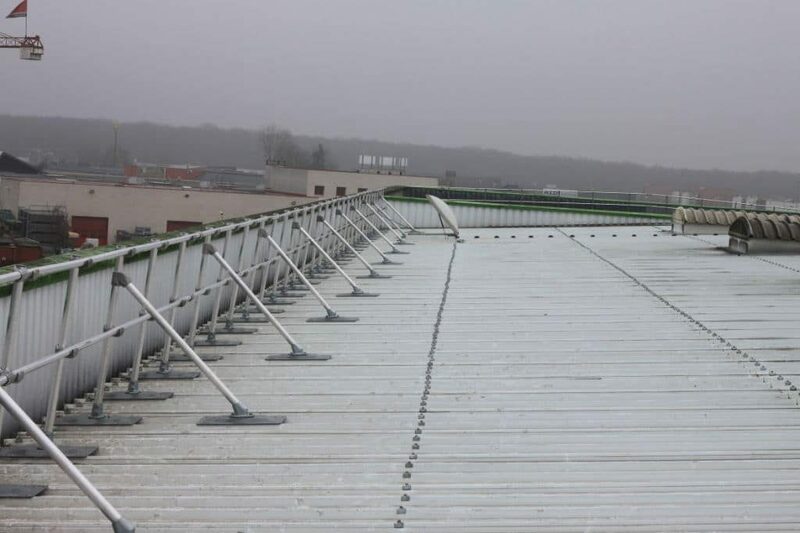 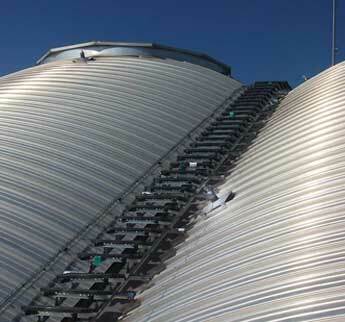 FlexGuard Topfix attaches directly to the standing seam without penetrating the roof surface. 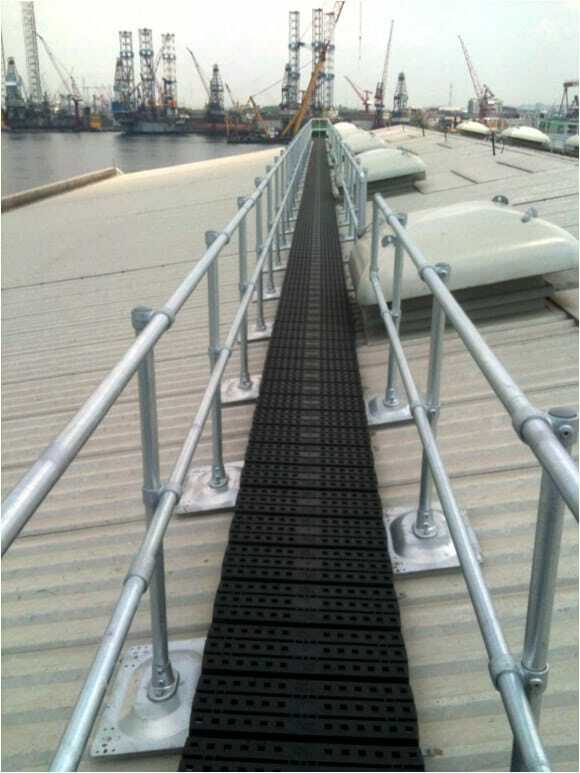 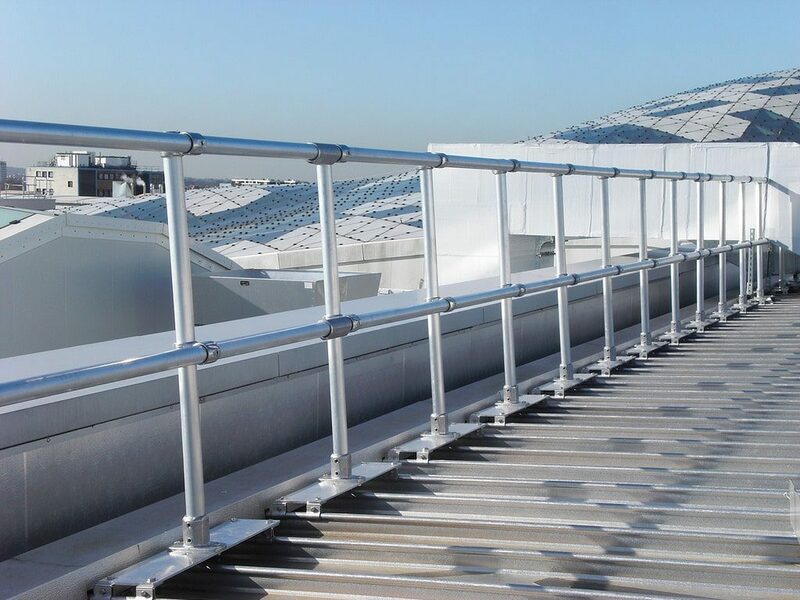 The railing connects directly to any type of standing steam using non-penetrating standing seam clamps. 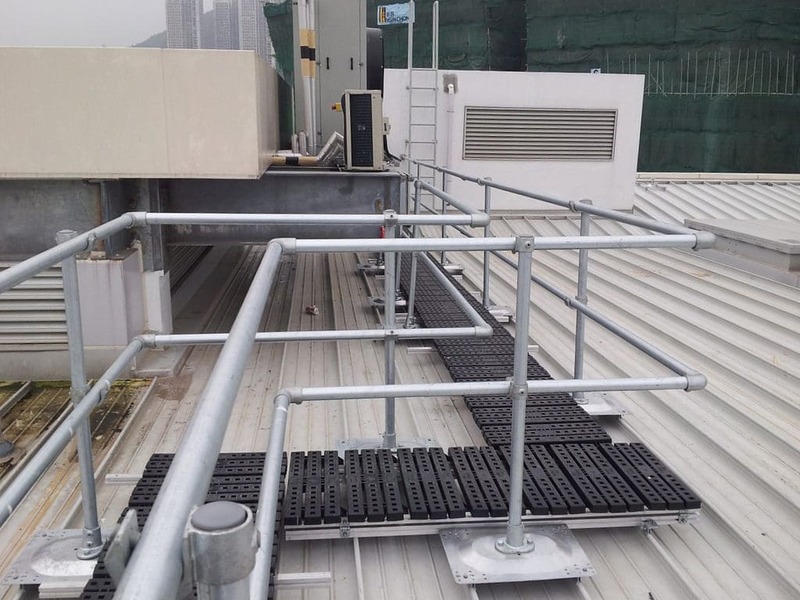 The uneven surfaces of corrugated metal rooftops can pose a significant slip and trip hazard in addition to standard rooftop fall hazards. 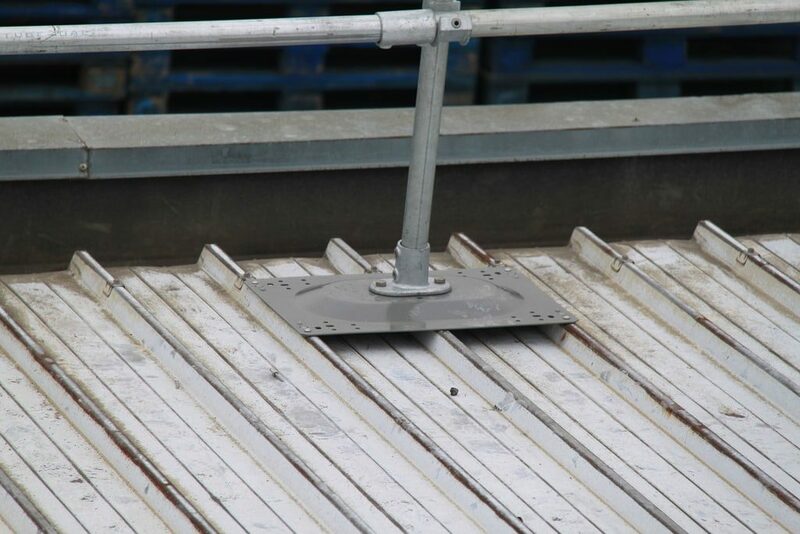 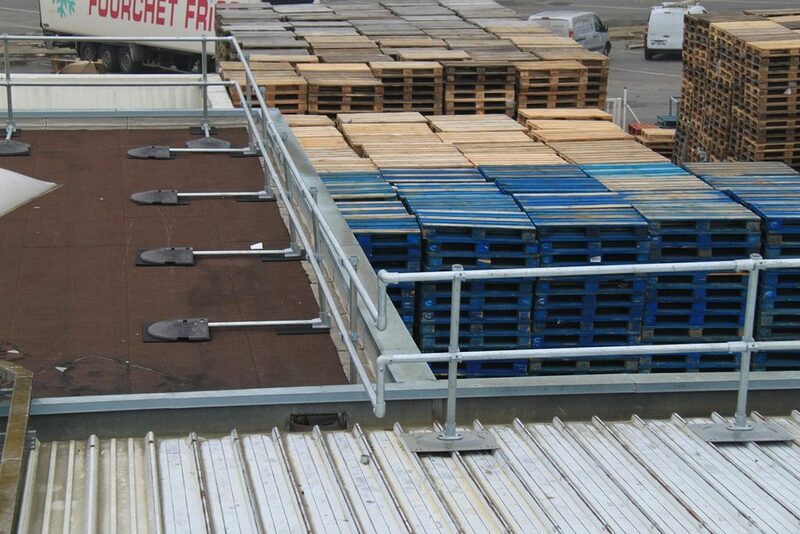 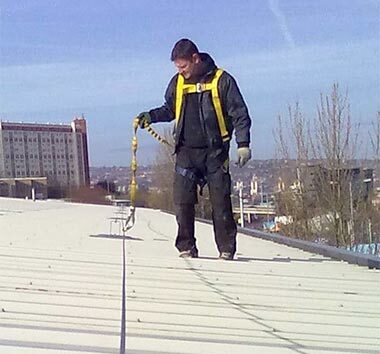 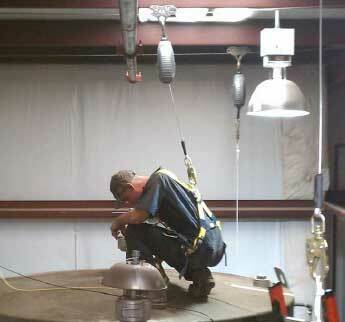 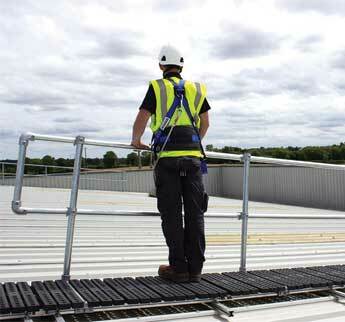 Having the right fall protection system to ensure the safety of people accessing the roof is critical. 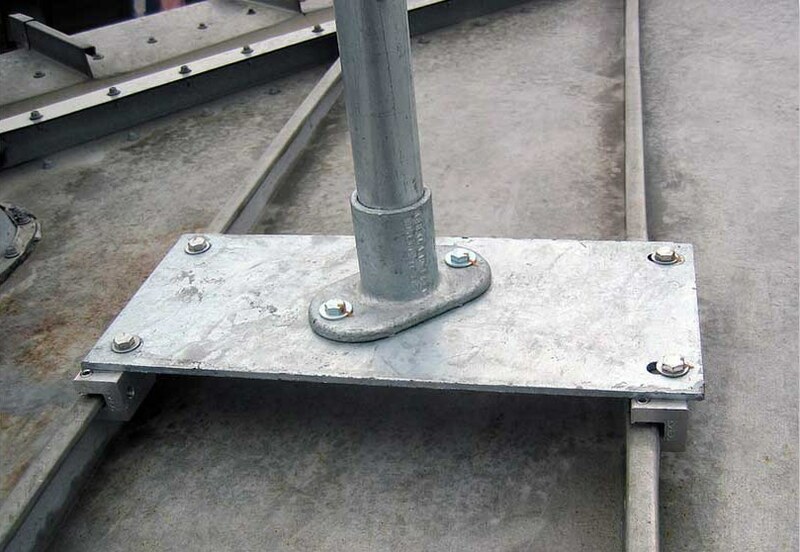 Railing systems for corrugated metal roofs can be challenging to engineer. 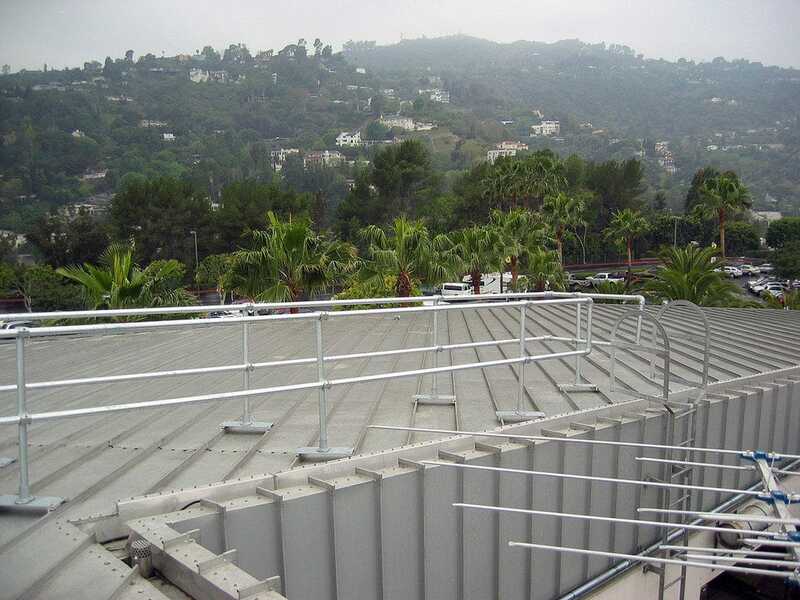 Weighted railing systems will not work due to the profile of metal roofs. 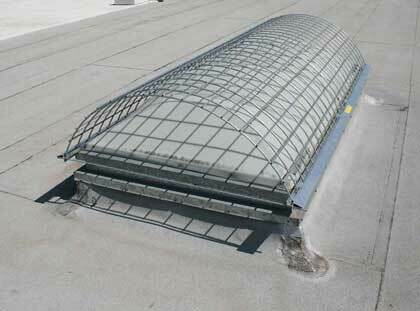 FLS’s FlexGuard Topfix is a pre-engineered railing system that mounts directly to the folds of a corrugated metal roof. 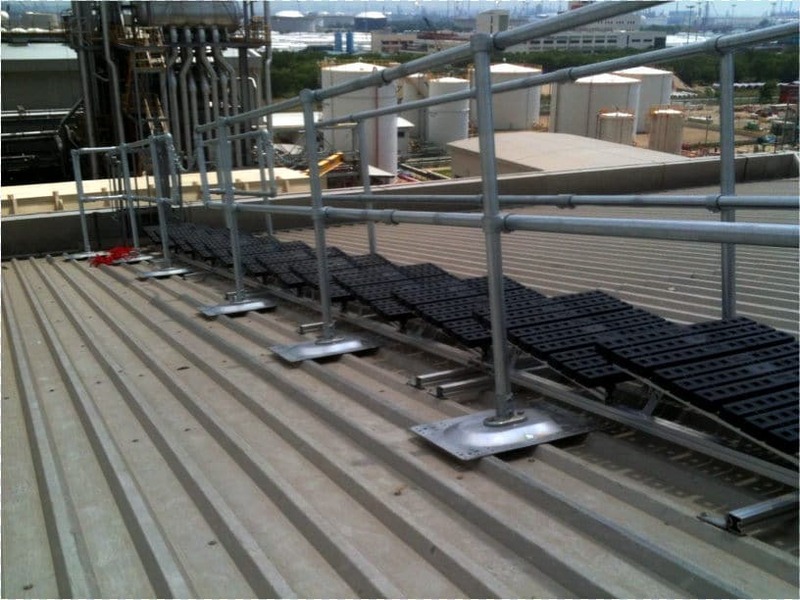 The Topfix guardrail system distributes the forces on the railing over a wide area requiring the minimum number of penetrations while ensuring the safety of rooftop workers. 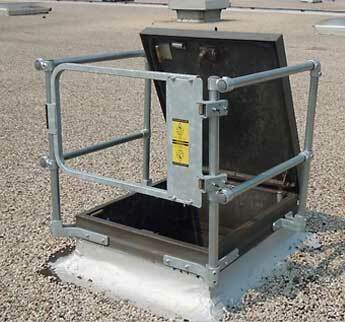 The FlexGuard Topfix base plate is engineered to distribute the load applied to the railing across a large portion of the roof surface. 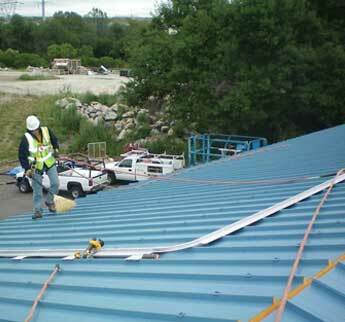 Corrugated metal roofs are not intended to take excessive loads in a focused location. 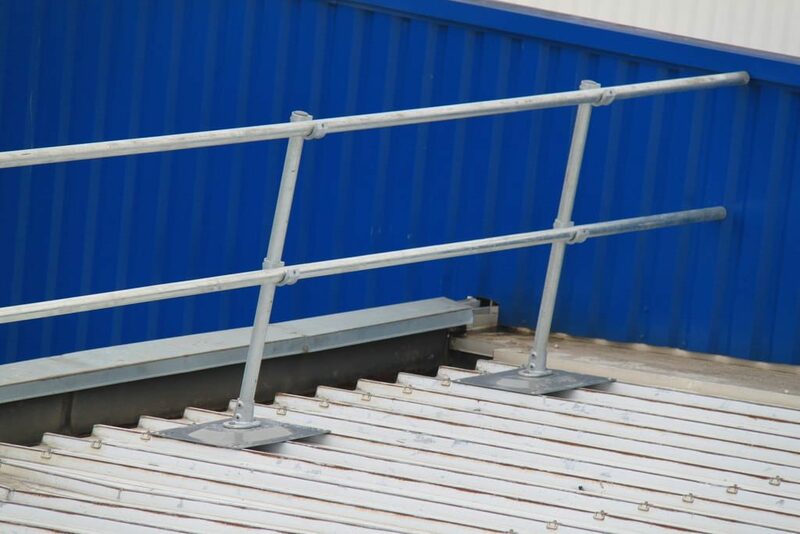 The base plate distributes these loads and ensures that the railing will hold firm in the event that someone trips into or leans into the railing. 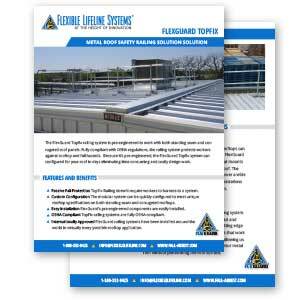 FlexGuard Topfix for standing seam rooftops provides OSHA compliant fall safety for rooftop workers. 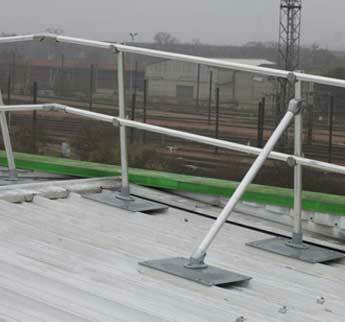 The safety railing system attaches directly to the standing seam metal roof profile using non-penetrating roof clamps. 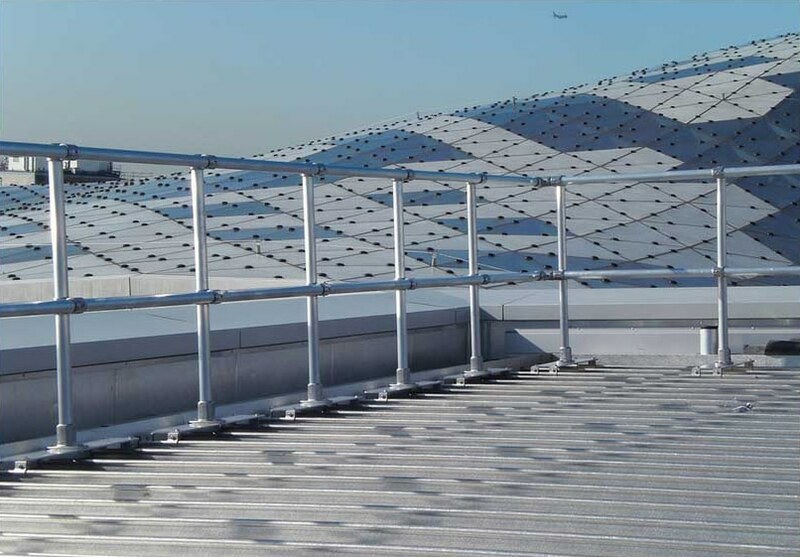 As with all of the FlexGuard railing systems, the pre-engineered modular components make the configuration and deployment of railing systems for even complicated standing seam rooftops a streamlined process. 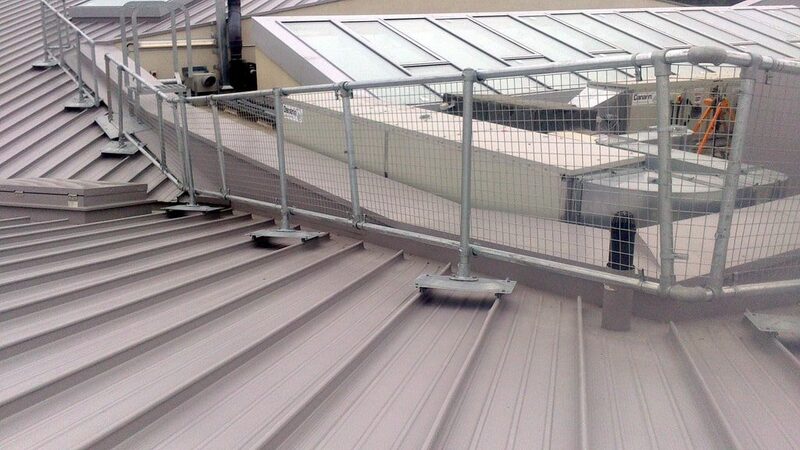 Our engineers can design a railing system solution for your standing seam roof. 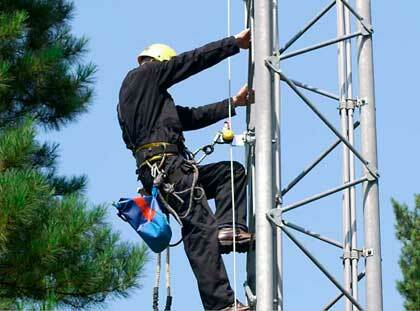 Contact us for a review and estimate. 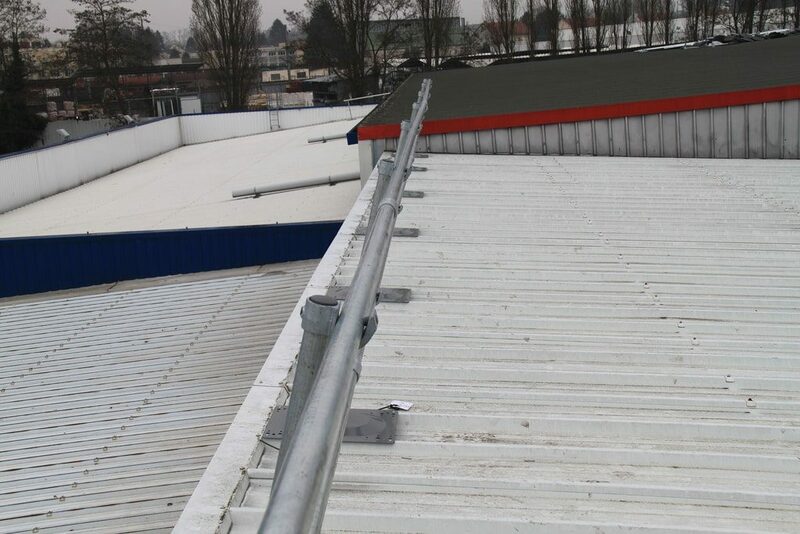 Until recently, applying a fall protection railing system onto a standing seam roof has been an involved and expensive task. 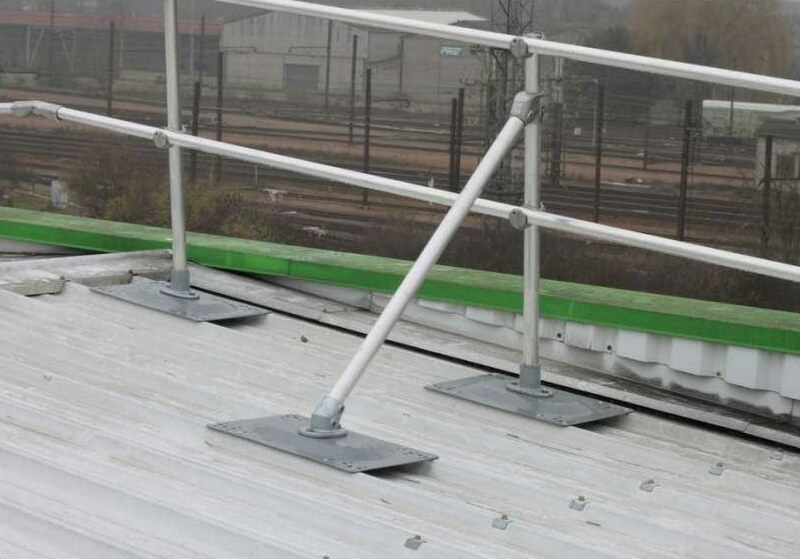 Flexible Lifeline Systems’ cutting edge engineering work has produced roof clamps designed to work with a wide variety of standing seam roofs. 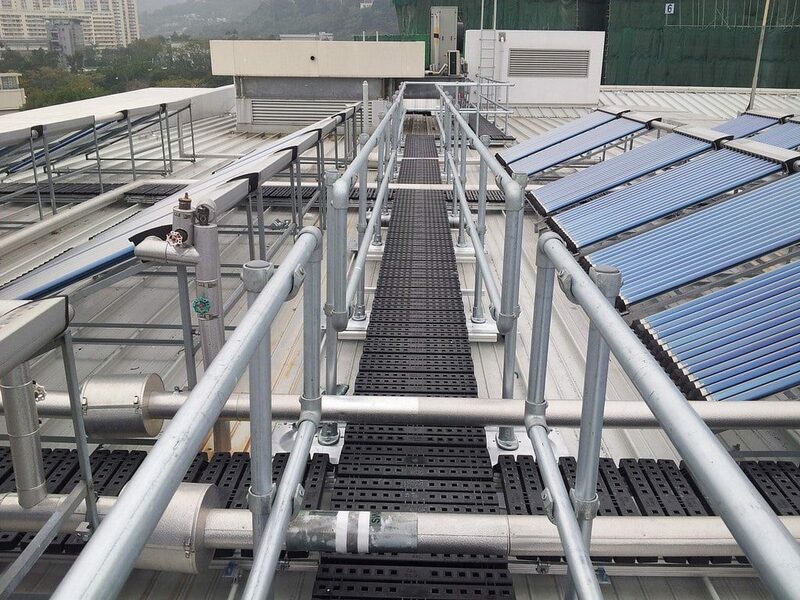 Whatever the layout of your standing seam rooftop, we can configure and attach a railing system to your metal roof without penetrating the roof surface.